Along with its new Xperia Z1 flagship handset, Sony has revealed two new camera gadgets that attach to your smartphone for taking better pictures. The two "smart lenses", called the DSC-QX10 and DSC-QX100 look like lenses but are standalone cameras with high resolution sensors (18.2MP Exmor R CMOS for the QX10 and 20.2 1.0-type Exmor R CMOS for the QX100) that attach with a supplied attachment to various smartphone models. The cameras connect to your smartphone through Wi-Fi (they can be paired with NFC) and allows you to take higher-resolution images and video with a variety of extra features like optical zoom and SteadyShot image stabilisation. 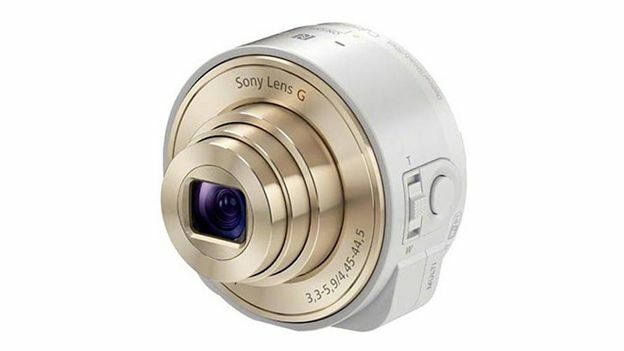 The QX10 and QX100 use a Sony G Lens and a Carl Zeiss Vario-Sonnar T lens respectively with the former offering a F1.8 wide angle aperture and the latter a F3.3 wide angle. Both have single-shot AF with contrast detection and rely on Memory Stick media cards for storing snaps - although they can be transferred or uploaded over Wi-Fi. Taking into account the on-board battery and Memory Stick, the relative weights of the two lens cameras are 179g for the QX100 and 105g for the QX10. We've spent some time with the smart lenses on the IFA event floor at Berlin, and you can read our hands-on review here. Also, check out our video hands-on review below.